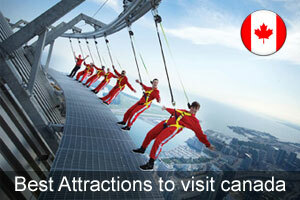 Canada has been the most desirable destination for tourists all over the world. The country has managed to attract the tourists from different parts of the world to enter Canada for tourism, study, work or immigrate. When compared to the previous year, the immigration department has experienced a drastic growth in the graph of tourism in Canada. One can never get enough of Canada attractions. Tourists who are travelling to the country must joint down the best tourism places to visit in Canada before entering the country. The country with its vibrant beauty welcomes the tourists around the world to visit the country without any discrimination. It is a vast land comprising majestic mountains, spectacular coastlines, and virgin forests, spacious prairies, Arctic tundra. Gros Morne National Park, Calgary Stampede, Victoria’s inner harbor, Bay of Fundy, Athabasca Falls, Churchill, Niagara Falls, Moraine Lake and cities such as Calgary, Ottawa, Whistler, Vancouver Island, Quebec City, Toronto and Montreal are some of the top tourism places in Canada. Every foreign tourist who wants visit Canada often has places to visit in Canada each time they come back. Tourists who want to visit the best attractions in Canada must obtain Canada visit visa which will help the tourist to enter and explore the country. The foreign tourist must carry all the proper travel documents along with identification documents. The applicant must take all the required documents to the interview, and if failed so, there are chances of visa rejection.